Yesterday the new American embassy building in Berlin was officially opened. The building has been a long time in the planning and making, but various security considerations have repeatedly led to postponements. Now that it‘s been built in the same spot where the USA had an embassy in the 1930s -a very rarefied spot at Pariser Platz, close to Brandenburger Tor- it has been variously described as functional, but uninspired. The comparison to the old Blücher Palais is interesting, but of course unfair – times have changed, and so have the ways of diplomacy. It‘s hard to say how much of that is due to said security constraints, but the building is certainly less adventurous than the nearby French and British embassies. 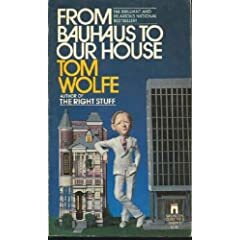 Tom Wolfe does not like where American architecture has gone in the 20th century. It started out all right with Frank Lloyd Wright, Louis Sullivan and others, but according to Wolfe, it took an ugly turn in the 1920s with the arrival of the Bauhaus-influenced International Style, which evolved into what came to be known as Modern Architecture. Then it got much worse in the 1930s when the Bauhäusler themselves fled Europe and made the USA their new home. Led by Walter Gropius and Mies van der Rohe, they had a profound influence on a generation of American architects, and their ideas dominated architectural thinking for the next 50 years.